Apple has a very nice sale these days on the iTunes App Store, which includes 20 amazing games from independent developers. The games come with a price tag of at least 50% off the list price, but only for a limited time, so make sure that you buy those who were on your wishlist for some time now. The list of games included in the Amazing Indie Games sale is quite impressive, and prices start from as little as $0.99 if you’re in the US or €0.99 if you are in the European Union (EU). These include Kingdom Rush Origins, Machinarium, Godfire: Rise of Prometheus, and Proun+. In addition, the Space Age: A Cosmic Adventure, Beatbuddy HD, Earn to Die 2, Magnetized, Inferno 2, Desert Golfing, Sunburn!, Battleheart Legacy, Lost Toys, Banner Saga, Out There, Quetzalcoatl, Rules!, Gunbrick, Bean Dreams, and Twisty Hollow games are also included in the Amazing Indie Games sale. While most of the aforementioned games can be purchased for as little as $0.99 / €0.99, the rest will cost $1.99 / €1.99, except for Banner Saga which costs $4.99 or €4.99, depending on the location from where you’re accessing the App Store. What are you waiting for? 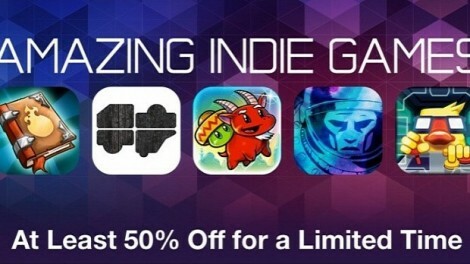 Go get yourself some amazing indie games for iPhone or iPad from the iTunes App Store.